If you know the line above and the song & movie it is from…you are old. The only reason I know it is because my dad used to play it (along with Battle Of New Orleans…composed by the same writer/singer) over and over again…on our fancy 8-track player. It was composed by Johnny Horton in 1960 for the movie of the same name starring John Wayne. To that end we go north for tonight’s beer…to Alaska. 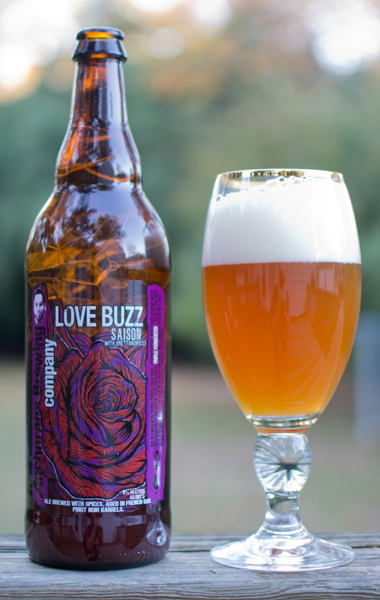 Beer #341 is Love Buzz Saison by Anchorage Brewing Company from the city of the same name, Anchorage. This Saison has an ABV of 8%. Love Buzz poured a cloudy orange with quite the nice frothy white head sitting atop of it. It sure did look pretty. I dipped my nose in…it sure was herbal and spicy smelling with awesome fresh cracked pepper & coriander. It had a nice citrus aroma also with oranges and some pineapple. I took a sip, the bitterness hit me first. It wasn’t overly bitter…just noticeable. Orange rind was the first thing I thought of…just slightly sweeter. The spiciness of the cracked pepper like flavor then takes over to the end of the drink. Throw in a hoppy grapefruit flavor in the back end and it made for a very nice tasting and pleasant brew. It finished quite dry. It had quite the medium body and was well carbonated. This was quite excellent…another beer that I really enjoyed and would easily recommend. I’m feeling in a great mood…Friday and all so this is going to get a big fat Kingly approval. Wow…100 degrees today in NJ with a heat index of 109. How did that song by Buster Poindexter go??? Hot…Hot…Hot. So lets refresh ourselves with a beer, beer #236 and #3 in the Horny Brewing Company fest. It can’t get any worse than the two previous…or can it? Exposed had a cloudy pale yellow color with another tiny ring of a white head. I’m already disappointed. The nose was very faint with a grain like odor and an even fainter odor of grass. It didn’t smell like any Saison I have ever had. There was none of that spiciness or yeast like aromas. There wasn’t any sweetness or fruitiness…just very faint odors, yep odors, of grains and grass. I reluctantly took a sip, wheat with maybe, and my mind could have made this up, a touch of lemon. All of it mingled in too a very bland tasting beer. There was nothing here that even reminded me of a Saison. After a few sips to try and find some redeeming qualities, which I found none, I downed it. That wasn’t an issue because it was very watery and light bodied and had little in the way of carbonation. Epic fail…the worst Horny Goat I have had yet. Crap, crap and more crap. If this was what craft beer was all about, I would stick to water. I find my well water has more flavor than this did. 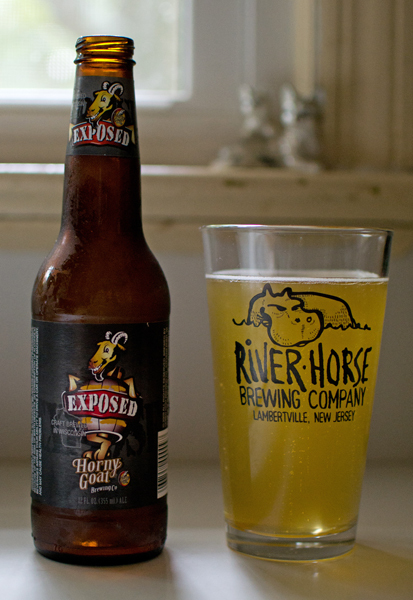 I have 3 more Horny Goat brews but with what I have experienced so far…I may have to make a run to the beer store to try something else. I love the outdoors. So much so just sitting on my front steps listening to the birds chirp and find food makes me a happy camper. I figured why not have beer #177, Colette by Great Divide Brewing Company, while enjoying the sights and sounds of a beautiful spring day. 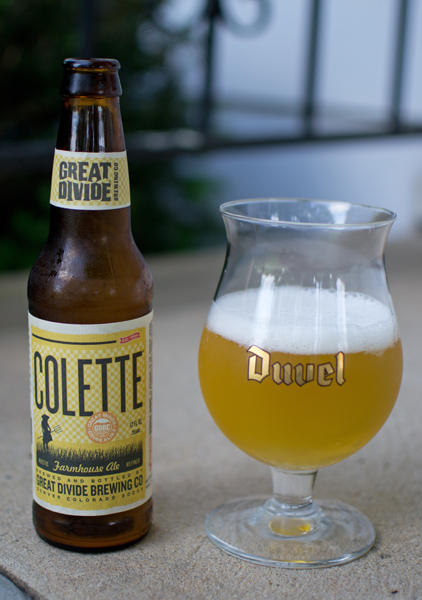 Colette, a Saison or Farmhouse Ale with an ABV of 7.3%, poured a lovely opaque golden yellow and had a white head sitting on top of it. The nose was tart with lemon and wheat and a bit of that yeasty spiciness. The tartness follows through in the taste. The wheat takes over mid drink. It had a bitter finish with a bit of a sour thing going on. It had an odd aftertaste that I couldn’t put my finger on. The mouthfeel was highly carbonated and had a medium body. Beware of the ABV as it snuck up on me…in a good way that is. Pretty decent beer. About the only thing I didn’t really like was the aftertaste. Lovely spring day was the order of the day today. 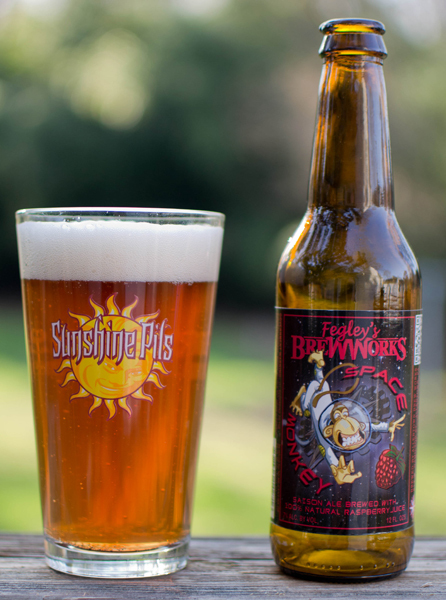 Outside I went to enjoy beer #137, Space Monkey by Allentown Brew Works from Allentown, Pennsylvania. This is a Saison or Farmhouse Ale with a twist, Raspberry. The ABV clocks in at 7%. I love the label on this but then again who doesn’t think monkeys are funny, monkeys in space are even funnier. Into my Troegs Sunshine Pils went this brew with a yellowish amber color, a bit like honey. A nice white head topped this but didn’t stick around. The nose, well it smelled like a raspberry iced tea. I have drank plenty of raspberry iced teas (both regular and diet) in my time so those aromas are quite familiar to me. I took a sip and surprisingly I got some Belgian yeast and a bit of bread like malt flavors (didn’t really get any of either in the nose) and then the sweet raspberry took over all the way to the finish. There was a very similar aftertaste here not quite unlike a raspberry iced tea, just more carbonated. It was medium bodied, crisp, and nicely carbonated. Pretty drinkable, but I could see how the sweetness here could turn people off. A unique beer indeed. The best way to sum this up is that is was like drinking an alcoholic, carbonated raspberry iced tea. If you like those, you may like this. I kind of liked it but I’m not quite sure how many I could enjoy, maybe more on a hot summer day? The sunshine state was showing off its namesake today. Sun, high clouds, heat (luckily the humidity wasn’t too overbearing)…what did all of that mean? Why a trip to the pool to bake you silly sausages…don’t worry though…I lubed up with plenty ‘o sunblock. 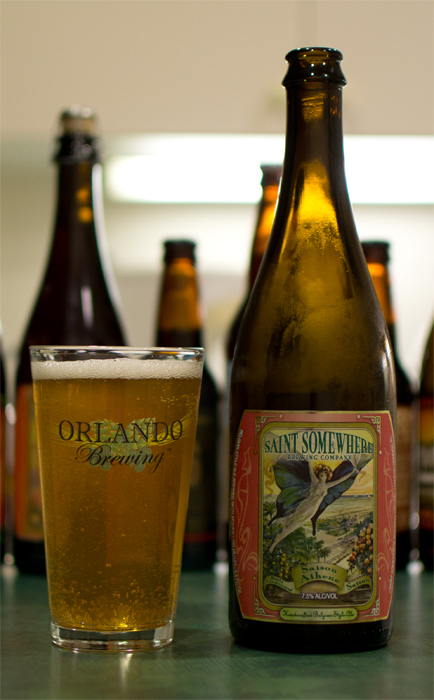 Beer #130 is another Florida brew by Saint Somewhere Brewing Company, Pay du Soleil. Todays beer is a Saison/Farmhouse Ale with an ABV of 8%. I’m in Florida and I had a bear of a time finding a palm tree low enough to take todays photo of the beer with. After much searching I found one. A nice cloudy amber with a huge creamy head that took forever to settle down looked back at me from the glass. The nose was very fruity and yeasty. Smelled good, my mouth was anticipating the taste. Hmm…tart was my first thought. I got a bit of apple, maybe a bit of grape, peach…mostly fruit in the taste. There was a slight alcohol finish to this. It was nice and dry. It had a medium body with tight tongue tingling carbonation (say that 10 times fast). Not too bad drinkability wise…maybe a tad too much alcohol presence to enjoy too many of these in a sitting. This was a solid brew…delicious! Yummy in my tummy! Alas…I only have one more Florida beer…but that is for tomorrow. Cheers from Florida! Spent the day at Hollywood Studios today…I love that place and Disney in general. I was surprised to find that in the parks, along with the typical Bud/Miller…they had Sam Adam Noble Pils. I’m going to have to try this one day. 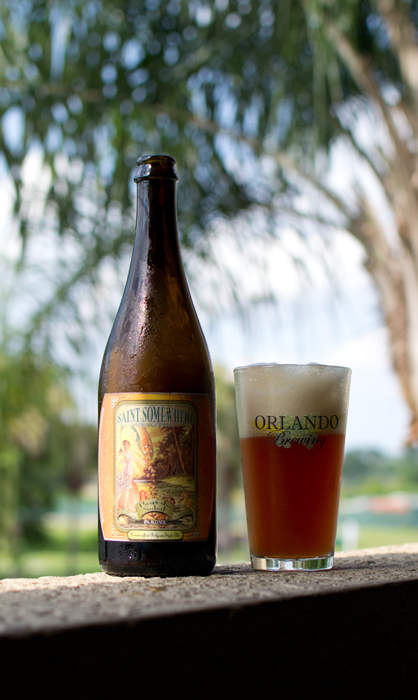 Beer #126 Saison Athene by Saint Somewhere Brewing Company. Another beer brewed in Florida, Tarpon Springs to be exact. This Saison or Farmhouse Ale has an ABV of 7.5%. Into the pint glass it went with a color that was a clear golden yellow. There were lots and lots of carbonation bubbles raising to the top only to be captured by the one finger width white head. I took a whiff…odd smell for a saison…lots of herbs. There were also some citrus like aromas and a yeast, spicy smell. To be honest, I had a hard time placing the aromas here. So I took a sip, I got some grapes oddly enough…it kind of tasted like a white wine. The mouthfeel was that of a medium bodied brew with quite a bit of carbonation. This wasn’t very drinkable for me…something about the taste didn’t sit well with me. This was an odd beer for me. The herby presence with the wine like taste kind of turned me off. What better way to waste away a rainy Sunday then to race Ferraris, McLarens, Paganis, & other supercars in the virtual world of Ibiza and Oahu. Welcome to Test Drive 2 Unlimited. Oh yeah…and drink some good beer too. 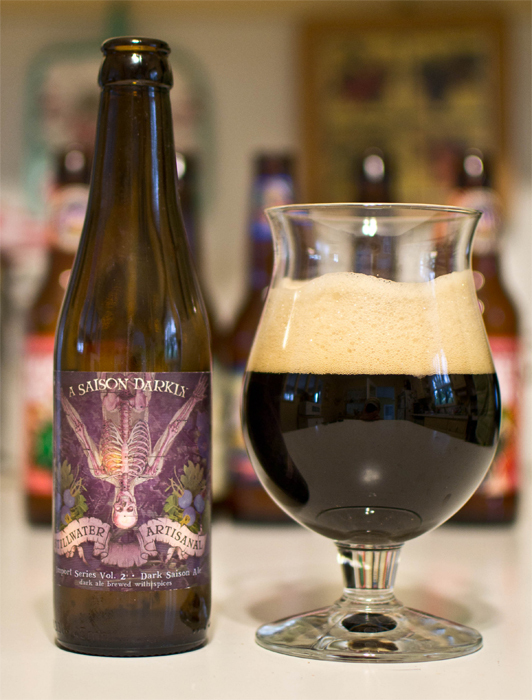 Beer #98 is A Saison Darkly by Stillwater Artisanal Ales from Baltimore, Maryland. This Saison or Farmhouse Ale has an ABV of 8%. It poured a deep dark black with a head that went to the top of the tulip glass. The nose was very light with a spicy pepper like aroma being the most noticeable. I also got a bit of dark roasted malts and that familiar Belgian yeast aroma but again, the nose overall was very mild. I took a sip and was greeted with a spicy almost fruity flavor followed by the dark roasted malts finishing off with a touch of alcohol. This was a medium bodied drink with a healthy dose of carbonation. It was a fairly easy brew to drink but the 8% ABV was there waiting in the wings ready to sneak up and bite you if you indulge too quickly. This was a decent brew but I’m still searching for a Saison to knock my socks off. Will I find it in the next 267 brews? Stayed tune to find out. Now back to racing exotic expensive supercars around the island of Ibiza and Oahu and if you are there, and hear my horn beeping away…get the heck out of the way or the King shall smoke thee.